October has been National Protect Your Hearing Month, and our experts at Safety.BLR.com® have been busy answering subscribers’ questions about hearing conservation. We’ve selected a couple for our EHS Daily Advisor readers—where does an office employee fit into a hearing conservation program, and what happens when an employee refuses to take a baseline audiometric test? 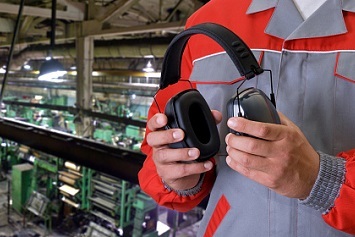 Question: An employee crosses a manufacturing shop floor where hearing protection is required to get to their office where they stay until the end of the day. Does that employee have to be in the company’s Hearing Conservation Program? Answer: According to OSHA, all employees exposed to noise levels at or above 85 dB on an 8-hour (TWA) or, equivalently, a dose of fifty percent, even for one day, must be included in a Hearing Conservation Program. This includes employees who may have only occasional exposures at this level. When monitoring noise for OSHA compliance, both continuous and impulsive noise sources have to be figured into the measurements. For example, an employee exposed to intermittent or impulse noise from a jackhammer or loud equipment will affect the calculation of the equivalent dose to determine whether the exposed employee exceeds the 85dB 8-hour TWA for the HCP. Question: We are implementing a Hearing Conservation Program and one of our employees refuses to take a test to establish a baseline. Can an employee opt out of the program? Answer: The OSHA noise exposure standard requires that all employees exposed to noise levels at or above 85 dB on an 8-hour (TWA) must be included in a hearing conservation program. We are not aware of any allowance for an employee to “opt out” of this requirement. See the OSHA interpretation letter that emphases “all” employees at https://www.osha.gov/laws-regs/standardinterpretations/2004-02-13-0. 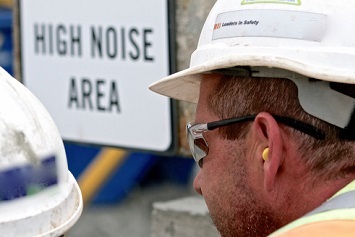 According to an OSHA letter of interpretation, OSHA’s noise standard requires only that audiometric testing be “made available” to all employees whose exposures equal or exceed an 8-hour time-weighted average of 85 dBA. The standard does not prohibit an employer from having a company rule that employees submit to audiometric testing. You should be aware, however, that the Americans With Disabilities Act (ADA) places certain limitations on employer required medical examinations. Among other things, such examinations must be shown to be job related and consistent with business necessity. See the OSHA letter at https://www.osha.gov/laws-regs/standardinterpretations/1995-01-23-1. Regardless of whether an employee has a baseline audiometric testing, employers shall ensure that hearing protectors are worn by any employee who is exposed to an 8-hour time-weighted average of 85 decibels or greater and who has not yet had a baseline audiogram. See the rule at 29 CFR 1910.95(i)(2). Note: This question was answered by experts at Safety.BLR.com. Not a Safety.BLR.com subscriber? Visit the site today and take advantage of all that it has to offer! Or if you would like to take a free trial, click here.